You can edit a Flow for an existing SharePoint list to modify automation and workflow. This article will show you how. You can edit a Flow that is already attached to an existing SharePoint list. Navigate to the list where you want to edit a Flow. At the top of the list click the Flow drop-down and then click See your flows. Your browser will refresh with the main Flow website (https://flow.microsoft.com) and you will see a listing of all of your flows. Click the pencil icon next to the flow you want to edit. Tip: If you have not already signed in to Microsoft Office 365 and SharePoint Online then you will be asked to do so. Configure the Flow and then click the Update Flow button. After the Flow has been updated, click Done. Note: You can view all of your flows and check status on the Flow website located at: https://flow.microsoft.com. To learn how to create a new flow in a SharePoint list, see Add a flow to a list in SharePoint Online. To learn how to delete a flow in a SharePoint list, see Delete a flow from a list in SharePoint Online. To learn more about SharePoint lists, see What is a list in SharePoint Online?. 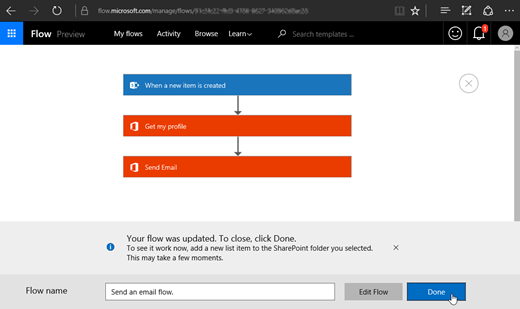 To learn more about Flow, see Getting Started with Microsoft Flow.